At least 17 have been killed when an overpass collapsed near Kolkata (which was formerly called Calcutta), India on March 31, 2016. Over 100 people are injured and over 100 are missing. One of the meanings of Kolkata is "field of the goddess Kālī." Kālī, is the Hindu goddess associated with empowerment, or shakti. She is the mighty aspect of the goddess Durga. 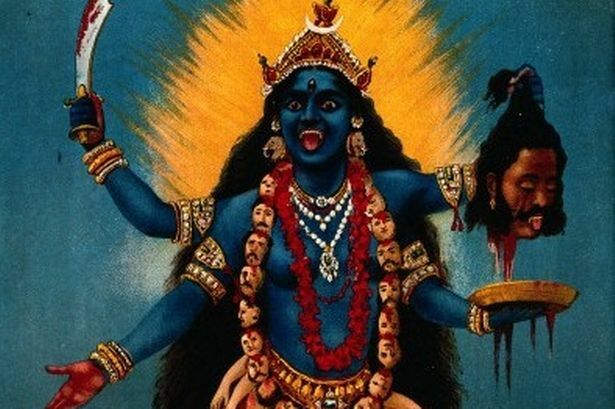 The name of Kali means black one and force of time, she is therefore called the Goddess of Time, Change, Power, Creation, Preservation, and Destruction. Her earliest appearance is that of a destroyer principally of evil forces. Source. Kali is associated with a tradition of carrying heads. Why? 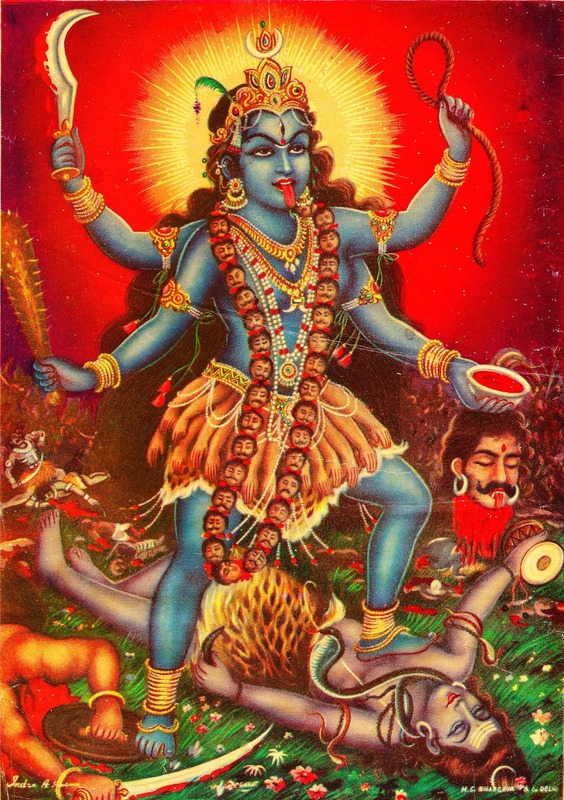 There are several traditions of how Kali came into existence. One version relates when the warrior goddess Durga, who had ten arms each carrying a weapon and who rode a lion or tiger in battle, fought with Mahishasura (or Mahisa), the buffalo demon. 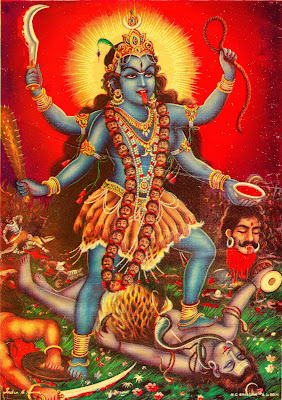 Durga became so enraged that her anger burst from her forehead in the form of Kali. Once born, the black goddess went wild and ate all the demons she came across, stringing their heads on a chain which she wore around her neck. It seemed impossible to calm Kali’s bloody attacks, which now extended to any wrongdoers, and both people and gods were at a loss what to do. Fortunately, the mighty Shiva stopped Kali’s destructive rampage by lying down in her path, and when the goddess realised just who she was standing on, she finally calmed down. From this story is explained Kali’s association with battlegrounds and areas where cremation is carried out. Source. Tridents and heads. 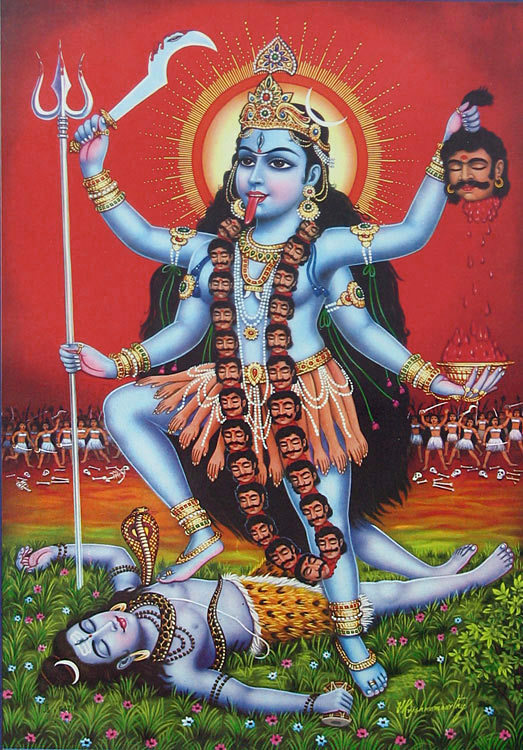 Kali's most common four armed iconographic image shows each hand carrying variously a sword, a trishul (trident), a severed head, and a bowl or skull-cup (kapala) catching the blood of the severed head. “The Hindu temple in southern India was packed with thousands for a religious festival early Sunday when the fireworks began - an unauthorized pyrotechnic display that went horribly wrong. Scores of devotees ran in panic as the massive initial blast cut off power in the complex, while other explosions sent flames and debris raining down, a witness said. Many people were trapped inside. "It was complete chaos," said Krishna Das of Paravoor. "People were screaming in the dark. Ambulance sirens went off, and in the darkness no one knew how to find their way out of the complex." The fire started when a spark from the fireworks show ignited a separate batch of fireworks that were being stored in the temple complex, said Chief Minister Oommen Chandy, the top elected official in Kerala state. 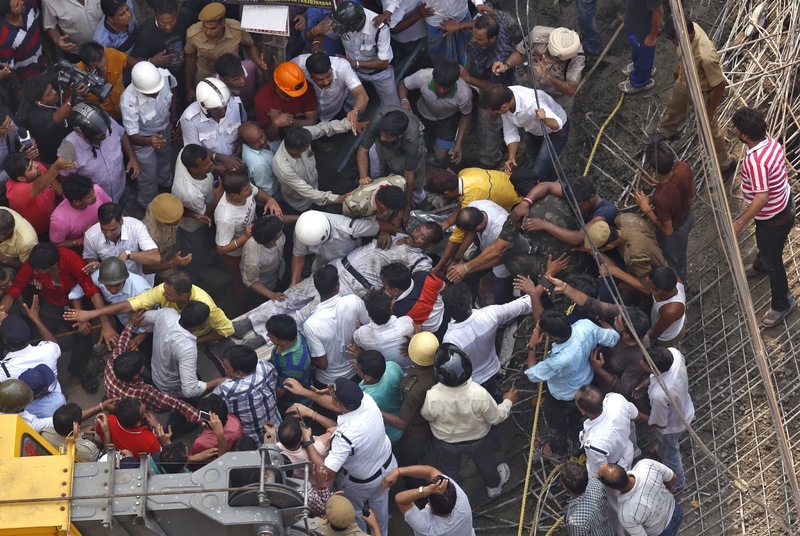 Most of the 102 deaths occurred when the building where the fireworks were stored collapsed, Chandy told reporters. About 60 bodies have been identified so far, he added. Das said six ambulances had been parked outside the complex as a precaution. They carried the injured to hospitals in the state capital of Thiruvananthapuram, about 60 kilometers (37 miles) south of Paravoor, as well as the city of Kollam. One of the explosions sent huge chunks of concrete flying as far as a kilometer (half a mile), said Jayashree Harikrishnan, another resident. Firefighters brought the blaze under control by about 7 a.m., officials said. 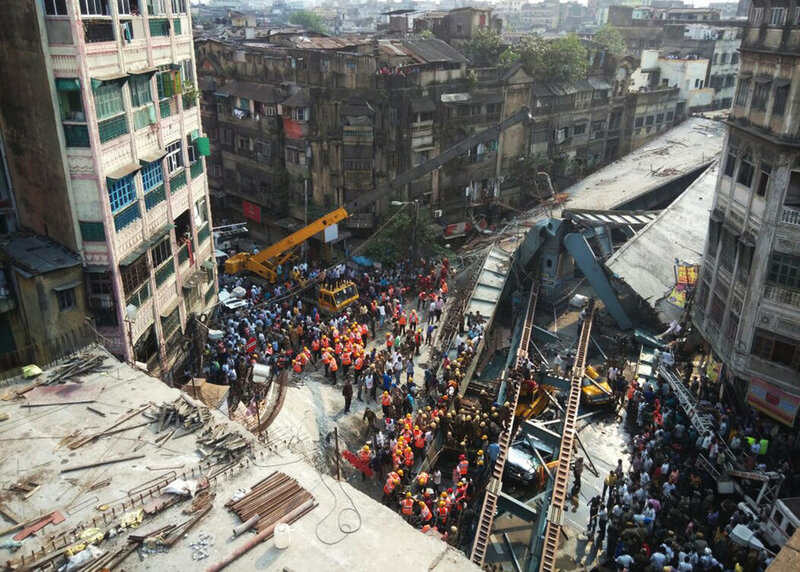 Rescuers searched the wreckage for survivors, while backhoes cleared debris and ambulances drove away the injured.